Wisdom of Life. : Why we should not flirt ! A couple was invited to a swanky family masked fancy dress Halloween party. The wife got a terrible headache and told her husband to go to the party alone. 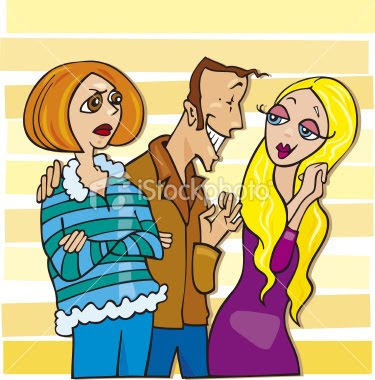 He, being a devoted husband, protested, but she argued and said she was going to take some aspirin and go to bed and there was no need for his good time to be spoiled by not going. So he took his costume and away he went... The wife, after sleeping soundly for about an hour, woke without pain and as it was still early, decided to go to the party. As her husband didn't know what her costume was, she thought she would have some fun by watching her husband to see how he acted when she was not with him. So she joined the party and soon spotted her husband in his costume, cavorting around on the dance floor, dancing with every nice' chick' he could and copping a little feel here and a little kiss there. 'You must have looked really silly wearing that costume playing poker all night!' she said with unashamed sarcasm. To which the husband replied, 'Actually, I gave my costume to my Dad .... apparently he had the time of his life'.